Following are some affirmations that can be used, in conjunction with Reiki, prayer and/or meditation to assist in clearing and balancing the chakras. These affirmations indicate the areas that each chakra relates to in reference to our thoughts, feelings and actions. From the Light of God within my being I release all judgments and concern over sexuality, procreation, organization, emotion and nurturance . Healing takes place by changing energy. Affirmations can be very powerful instruments of change and transformation. The spoken word, influences both mental and emotional patterns which are held in the etheric field. The more frequently an affirmation is spoken throughout the day, the more effective it becomes. Using affirmations is like reprogramming a computer. You put new "codes" in to replace old outdated programs. If you have a very deeply seated negative core belief, it may be necessary to combine other methods with the affirmation. Working with Reiki and the mental/emotional frequency in combination with affirmation can be very effective, because you are also energetically affecting the old belief in addition to creating a new thought pattern. When you have done something that you wish you had done differently, have you ever said "Ohhh...I am so stupid!". How about "I am getting so fat!" Or has anyone ever said to you "If you can't do it right, don't do it at all! ", or "If you can't do this, you will never amount to anything." or "You have to work hard for everything in life". or "Life isn't easy". Are any of those familiar? Statements like that affect our personal programming, beliefs or codes. Pay very close attention to your body, and how you feel. Begin very slow, very deep breathing and focus on relaxing your body from head to toe. Perhaps you might do an inner scan. Just close your eyes and bring all your awareness to the top of your head (inside your head). Then slowly move your awareness down through your body. Be aware of how easily, or difficultly your consciousness moves. Does it move smoothly and easily all the way to your toes, or is there a feeling of sluggishness, pain, or tingling anywhere? Just make a mental note of anything you feel. Now, repeat this three times "I am sooo stupid!". Check in now and see how you feel. 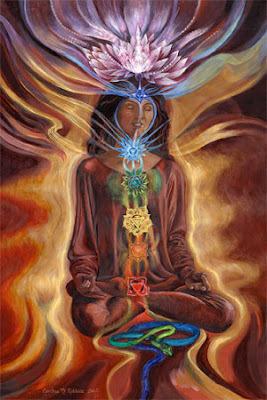 Do another scan, pay attention to each of the chakras and make note of any differences you feel. "I am a brilliant, confident, successful person!" Check in again and make note of changes. and how they affect your emotions. There is a direct interface between your mental body, which houses your mental programming, and your emotional body which is home to your emotional coding. When thoughts/words/energy enter the mental body, they connect to the emotional body and create an emotional response. They can affect your sense of self-worth, or personal empowerment and many other aspects of your life. Take some time to reflect on what type of etheric programmer you are. Do you feed yourself positive messages, or negative ones? It is relatively easy to create changes in your thoughts, beliefs and emotions by using affirmation. In doing so you can positively affect your physical body as well. Illness often begins in the mental body. By changing unhealthy thought patterns, you can change the way you process your emotions, and ultimately the energy that flows into your physical body from your etheric field, chakras, and through your meridians.